The footbridge between Lions and Raymore parks after last night’s snowfall. Click to enlarge. Residents and their dogs gather Monday July 10 for the official Raymore Park leash-free zone opening. Note the entrance to the small dog zone (black gate) is not directly accessible from the park. Quite a few dog owners and their pets were present on Monday evening for the official opening of Raymore Park’s leash free zone. Councillor Mike Ford had organized the event and worked the crowd, introducing himself informally to residents and later made a short speech. People seemed pleased with the facility but the councillor heard a few concerns; namely that the topping of ‘pea gravel’ used to improve drainage seems to bother some pets. The lack of shade was another issue as was access to the small dogs’ zone (currently entered from the large dogs’ zone). Ward 2 Councillor Mike Ford speaks to the assembled crowd. 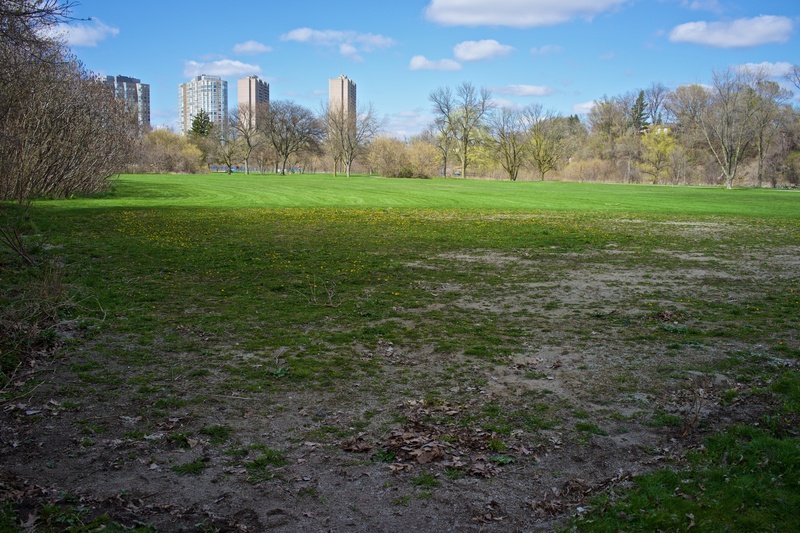 Councillor Ford seemed sympathetic to these and other concerns and promised some consultation with the people from Toronto Parks (Parks Supervisor Lynn Essensa was in attendance). He also sympathized with the patience of residents who have put up with Raymore Park’s long period of being a construction zone and said he was working on getting the last remaining project (sewer pipe re-lining) expedited. Raymore footbridge and a parked bicycle cast a shadow on the swollen Humber River. The ‘rock’ with tree trunks on it is actually the remains of the old suspension footbridge abutment that played such a terrible role during Hurricane Hazel. Our local parks are undergoing a variety of transformations. In Raymore Park, rehabilitation of the retaining wall staging area is well under way, a new off-leash area has been set up while sewer re-lining along the Humber is still likely to take a few more months. Rehabilitation work continues after the Raymore Park retaining wall construction. New trees have been planted this week. In Lions Park, heavy vehicles undertaking sewer work have destroyed the bike path and cones have been placed to warn cyclists and pedestrians. Heavy construction vehicles have destroyed the dedicated bike / pedestrian path near the Raymore footbridge. 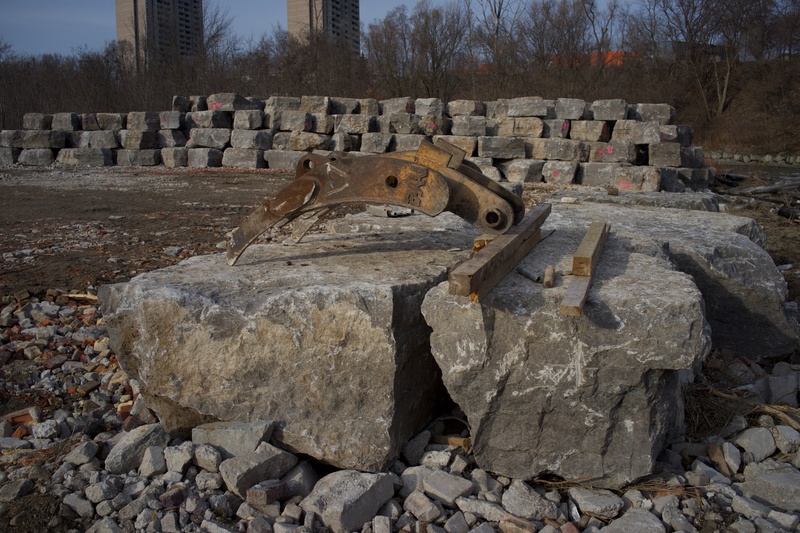 In Cruickshank Park, stabilization work is taking place that will prevent further erosion of the TCHC property at 1025 Scarlett Road. At the moment a bridge is being used to access the site and the walkway through the park has been blocked in order for the work to proceed. The end date is set for next month but judging by the current state of construction, that looks extremely optimistic and unlikely. 1025 Scarlett Road from the Weston side showing the bank stabilization work. The temporary bridge allows access to the work from the Weston side. Needless to say, the bike / pedestrian trail (Humber Trail / Pan Am Path) needs to be re-paved. When this will happen is anyone’s guess but all work involving heavy construction vehicles will have to be finished no doubt. Construction projects seem to take longer than advertised in this part of Toronto for some reason. Anyway, probably not this year. This will mean some tough sledding for walkers and cyclists for quite some time. One good thing is that the replacement path, when it finally gets here, will be built wider to meet new city standards. According to newly minted Ward 2 Councillor Mike Ford, the leash free zone in Raymore Park began construction in earnest at the beginning of October. The plans are available at this link. Anticipated opening is set for next spring. An off-leash zone/area for dogs is about to be built in Raymore Park. It will be located by the larger of two baseball diamonds and will have areas for small (< 20 lbs) and large dogs. There will be two gates and two paved pathways from the Pan-Am Trail for access. Unlike many leash-free zones, this one will be about 450m from the parking lot, and even further when Raymore’s parking lot is closed for the winter. The area may be larger than the outline in the photograph because of the later addition of a separate small-dog section. Workers have already removed the baseball diamond fencing. The surface of the zone will be 4-6″ of pea gravel on top of a mesh filter which will help with drainage. TRCA is anxious that there be no runoff from the zone into the Humber. Fencing will be post and paddle, 1.5 m tall and made of northern pine. It will be reinforced with wire mesh 4-6″ deep to slow down dogs that dig. Benches will be installed for owners. Looking north from the proposed leash free zone. The zone’s original opening was anticipated to be this spring but there was a delay in the opening of the area because of work on a retaining wall nearer the park entrance. This is taking much longer than the expected March 31st completion date but should be finished by October. There is only one entrance to the park and so the retaining wall and another job – an upgrade to the path will be done first; after that, sewer work will be ongoing. At the last meeting on the topic, council officials thought that the area would take about a month to set up and would be open by ‘Thanksgiving at the latest’. 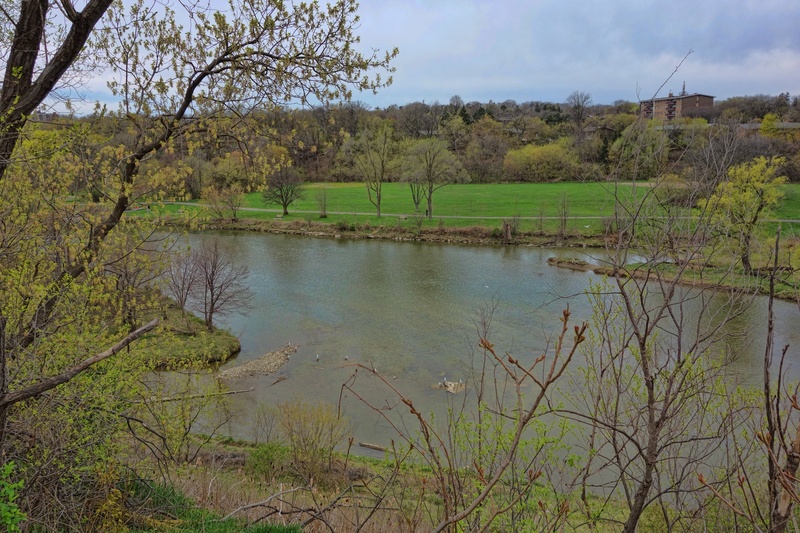 TRCA has plans to plant trees along the north end of the area and between the zone and the ravine slope. This will provide storm runoff relief and shade for the area (and perhaps some sound mitigation for nearby homes). A view of the area from the opposite bank of the Humber. Hours of operation: 7 am – 9 pm but people on foot will be able to access the area at any time. The parking lot will continue to be locked at 9:00pm daily and re-open at 8:00am and will be closed for the Winter between November 1st and April 30. The area will be self-policing and residents are expected to supervise and pick up after their pets. Comply with all signs and boundaries. Dog(s) must be on leash at all times except when in the designated off-leash area. All dog(s) must have a visible municipal license affixed to the dog(s). Dog(s) must remain in off-leash area so as not to trample or endanger plant material and other park resources. Any dog(s) that has been issued a muzzle order by the Medical Officer of Health. Dogs shall not chase wildlife. Pick up after your dog(s) and place waste in receptacle or take home for disposal. Keep dogs in sight and under control at all times. Do not leave dog(s) unattended while in off-leash area. Repair holes dug by the dog(s) under your control. Violation of Bylaws are punishable by fines. Stone blocks stacked and waiting to be placed in the Humber. Raymore Park normally closes its gates for the winter. This year, the park has seen truck after truck rumbling down the driveway to work on building up the east bank’s retaining wall where the Humber curves sharply southward. Studies have shown that the existing wall built in 1981 is below the necessary height and was topped by high water as recently as the flood of July 8, 2013. Even before that, more than a decade ago, the owner of a house on Sykes Avenue in Weston suddenly lost several feet off the back end of their property. The house overlooks a sharp curve of the Humber River as it turns to the south. During April rains in 2004, the rear of the property abruptly vanished along with several mature trees and other vegetation. Luckily nobody was standing near the edge. The edge has continued to erode further downstream, endangering riverfront properties on Denison. After extensive study, TRCA decided that in order to stabilize that stretch of the Humber, a 6.5 metre tall ‘replacement armourstone wall’ and stabilization measures need to be put in place on 170 metres of the east bank before more land disappears downstream. This is a very large project and because the winter was so mild, the ground had to be reinforced with a layer of brick and concrete fill. Another project under way (once the retaining wall is built) will be sewer rehabilitation along the length of the Humber. This work will increase the capacity of the trunk sewer (I wonder if a certain rental building by the Weston Hub has anything to do with this). Not only that but the cycle / pedestrian pathway needs to be upgraded as it is narrower than the current standard. A wider surface is to be installed that will have a centre line and other markings. Hopefully the spandex clad and vexatious Lance Armstrong wannabes will be a little more gracious when they have more room to manouvre. Once that project is complete, a new leash free zone will be installed just north of the weir occupying most of the southern baseball diamond. This work is expected to be completed by Thanksgiving.